On December 13th, 2015, Fox News reported that Non-Muslim high school girls were made to wear Muslim hijab to promote acceptance of Islamic beliefs. The event, organized by the school's Muslim Student Association, featured 17 non-Muslims wearing the garment and speaking with other students about the meaning of the hijab. Vernon Hills High School principal Jon Guillaume told the Daily Herald. "I think this is an opportunity for our kids to embrace the Muslim community within the school." "You can’t really understand or judge a person and their beliefs until you understand why they do it and what it’s like for them to do what they're doing," said senior Yasmeen Abdallah, the president of the Muslim Students Association. So is this a part of a cultural Jihad? It has been reported that the Muslim Students Association is affiliated with the Muslim Brotherhood and was a proxy named an un-indicted co-conspirator in the largest terrorist funding trial in our nation's history. 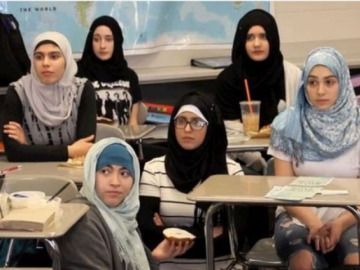 While there was no word on whether the kids made to wear the hijab were Christians or Jews, the Muslim Students Association sponsored the "wear a hijab to school" event at Vernon Hills High School in Chicago in order to "provide a better understanding of the Muslim faith." I can't help but wonder how it would have went down if the school told Muslims to wear a cross around their necks or a yarmulke on their heads to "provide a better understanding" of those faiths? I don't think that would have ever happened, thus the double standard. Besides the double standard, I have to ask if perhaps teaching the students why the Muslims see anyone who is not a Muslim as an enemy would be a way to better serve their education of the Muslim faith? How about dressing the girl students in traditional Muslim hijab and then taking away their rights? How about those girls find out how easy they can become candidates to be stoned? How about they dress as Yezidi slaves at a Muslim slave auction, or dress them as suicide bombers so they know how it feels to walk the walk of a faith that kills women and children? Would this also give them a better understanding of the Muslim faith? I think it certainly would. While the Muslim Students Association has made a point of saying that the event was planned last May (2015) and was not a response to Islamic terror attacks in Paris on November 13th, or to the massacre in San Bernardino on December 2nd, both it and Chicago school did not make any effort to cancel the event out of respect for those slaughtered by people of the Muslim faith who see terrorist attacks as justifiable. Maybe the students there should have been asked if they condone those attacks? If so, then the indoctrination may be working as planned. Maybe a better understanding of the Muslim faith means understanding their barbarism? With the separation of church and state, why is this Muslim indoctrination class was seen as OK by those in charge at the school and city levels? Why was this class permitted in a public school when Christian indoctrination would not be OK? Is there a concerted effort by city and school officials to endorse Islam over other religions like say Christianity or Judaism? Why haven't the people responsible for putting this on been terminated instead of being allowed to stay and do this again? Will that high school give equal time to Christians and Jews in the future? I doubt it! These are legitimate questions since a public school in New York has seen fit to ban Christian celebrations and American traditions including Thanksgiving and Christmas, the Pledge of Allegiance because of the reference to a Christian God, and banning Santa Claus. Yes, the principal of Public School (PS) 169 in Brooklyn has banned Santa Claus, banned the Pledge of Allegiance, replaced Thanksgiving with the term "Harvest festival," and has replaced Christmas with the term "Winter Celebration." 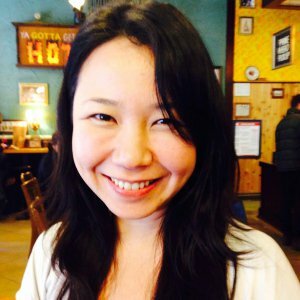 The school's new principal, a woman by the name of Eujin Jaela Kim, age 33, has given the Sunset Park, Brooklyn, school a Politically Correctness cleansing befitting some Communist commissar. In contrast to the Muslim indoctrination courses going on in some public schools around the nation, in Brooklyn at PS 169, PTA president Mimi Ferrer said administrators there told her, "We definitely can’t say Christmas, nothing with Christmas on it, nothing with Santa. No angels. We can’t even have a star because it can represent a religious system, like the Star of David." Though 95% of the 1,600 kids at PS 169 are Asian or Hispanic and Christian, it was reported that a memo last month urged the school staff to "be sensitive of the diversity of our families. Not all children celebrate the same holidays." Yes, in other words, "Don't offend Muslims!" Although a recent directive to all schools, the city's Department of Education stated it permits holiday symbols including Christmas trees, kinaras (candleholders for Kwanzaa), dreidels, Hanukkah menorahs and the Islamic star-and- crescent. But, displays that "depict images of deities, religious figures or religious texts" are prohibited. That doesn't seem to matter. In a memo to staff this month added, "In case you are wondering about grey areas: Santa Claus is considered an 'other religious figure.'" If power corrupts, this school's principal Kim is a prefect example of just how insane with power one person can become. Soon after joining PS 169 in May of 2014, her first time as a principal was to order the faculty to clear their classrooms of "clutter." Yes, she ordered hundreds of new text and other books and loads of supplies to be moved into the gym. Once there, she allowed parents and other community members to take what they wanted. The rest was tossed in the trash. She then had people paint over and remove historic murals there. And with school dollars said to be tight, principal Eujin Jaela Kim dumped boxes of newly purchased reading books in the trash or moved to the the basement. Instead of books, she spent scarce school funds on seven 70-to-80-inch Sharp flat-screen smart TVs, which retail at about $3,000 each. The TVs have been mounted in the auditorium, three over the stage and two on each side. And yes, the TVs have never been used. ​​So yes, while this principal dismantles core instruction, American tradition, and history at that school, make no mistake that Kim is behind the Politically Correctness cleansing and all out assault on the Pledge of Allegiance, Thanksgiving, Christmas, and even Santa Claus. Sounds familiar? Yes, it sounds like what the Communist tried to do to eliminate Christianity and Russian history after the October 1917 Communist Revolution. And yes, it sure sounds a lot like what ISIS is doing when they are destroying Middle Eastern history and attacking Christians over there. The reader who sent me this article asked, "Could she be a Communist or a Muslim? Or, could she be an ISIS sympathizer like President Obama?" Her atrocious policies of eliminating American traditions and attacking Christian celebrations are a great deal like Obama's policies since taking office. As with Obama and the Democrat Party only caring about keeping the nation divided, does she care that she's robbing her school's children of their nation's heritage and ability to assimilate into American society? Does she care that this will hurt the kids at her school? Frankly, I really believe, it doesn't mater to those with such agendas. Is she helping to prepare that school for Muslim indoctrination? Does she, like President Obama, see nothing wrong with attacking Christian traditions to fundamentally change America into some Socialist/Communist model state? I don't know. But yes, either is very possible. There are more folks than just me who see the approval of Muslim indoctrination classes and the attacks on Christians in America as a Liberal agenda to undermine America as the biggest Christian nation in the world. I know that I'm not the only one who thinks that Democrats, Liberals, so-called Progressives see Christian values as a threat and in direct opposition to Socialism/Communism ideals which sees the "state as being god-like." And frankly I'm not the only American who now believes that Obama and his White House is actively prosecuting Christians who spread the word of Jesus Christ while looking the other way as local, state, and federal government entities sponsor the spread of the Muslim faith. Their efforts have become very obvious. By sponsoring Muslims, the Obama White House is actively trying to change the demographics of the United States. By changing the demographics, the makeup, of the United States, he can destroy America's overwhelming belief in Christian morality. And with that, Obama truly succeeds in fundamentally changing America for the worse.